A special election for New York’s 11th congressional district was held on May 5, 2015 to fill the vacancy created by the resignation of Michael Grimm. Grimm, a member of the Republican Party, announced on December 30, 2014, that he would resign from the House effective January 5, 2015, and not take his seat for a third term following his guilty plea for tax evasion. On May 5, 2015 Republican candidate Dan Donovan defeated his Democratic challenger Vincent Gentile in the election and filled the vacant seat. In April 2014, Grimm was indicted on twenty felony charges, including mail and wire fraud, perjury, obstruction of justice, employing illegal immigrants, and conspiring to defraud the United States after it was found that he under-reported revenues and employee wages relating to a restaurant he owned. He surrendered to the police and was released on $400,000 bail. Vowing his innocence, Grimm continued his campaign for reelection, and defeated Domenic Recchia, the Democratic Party nominee, by 53%, Grimm’s highest margin in his congressional career. On December 23, 2014, Grimm pleaded guilty to one charge of felony tax evasion. All other charges were dropped as part of the plea bargain. Grimm indicated that he would not resign his seat. However, on December 30, Grimm announced that he would resign from Congress on January 5, 2015, rather than be sworn in for his elected term. 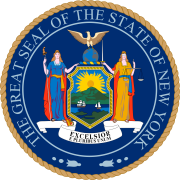 According to the U.S. Constitution (I.2.iv), Governor Andrew Cuomo is legally required to call a special election to fill the seat, which under the terms of the New York Constitution is to be held within 70 to 80 days of his announcement. On February 2, Cuomo, who had given no indication of when he would call the special election for, said that he was "looking at it now" but didn't have a timeframe for setting a date. Staten Island Attorney Ronald Castorina, Jr. filed a lawsuit on behalf of 8 Plaintiffs from Brooklyn and Staten Island, Republicans, Democrats, Independents, and Non-Enrolled parties, to force Cuomo to call a special election and on February 17, Judge Jack B. Weinstein of the United States District Court for the Eastern District of New York ordered Cuomo to either schedule the election or explain why he was delaying, or he would schedule the election himself. Cuomo's office replied that he would "announce the date" for the special election "shortly". On February 20, Cuomo announced that the election would be held on May 5. Due to the nature of the election, local party leaders in Brooklyn and Staten Island selected their nominees, replacing a primary. Besides the Democratic and Republican parties, the Conservative, Green, Independence, Reform, Women's Equality and Working Families parties are qualified New York parties. Under the terms of electoral fusion, a candidate may be nominated by multiple parties. No nominee. Presumptive nominee Dan Donovan refused the line after pressure from the Conservative Party. ^ "Special Election 2015: Final vote count, turnout, district breakdown". S.I. News. May 6, 2015. Retrieved May 6, 2015. ^ "NYC Republican Donovan Wins U.S. House Seat Vacated by Grimm". Bloomberg News. May 6, 2015. Retrieved May 6, 2015. ^ Alexander Burns (May 5, 2015). "Donovan Wins Race for House Seat Grimm Vacated, A.P. Says". The New York Times. Retrieved May 5, 2015. ^ Stephanie Clifford (April 28, 2014). "Grimm, Staten Island Lawmaker, Is Charged With Fraud". The New York Times. Retrieved January 2, 2015. ^ Jason Horowitz (October 14, 2014). "Under Indictment, Grimm Fights to Keep His Congressional Seat". The New York Times. Retrieved January 2, 2015. ^ Jason Horowitz (November 4, 2014). "Michael Grimm Overcomes Democrats' Campaign to Capture His Congressional Seat". The New York Times. Retrieved January 2, 2015. ^ "Rep. Grimm pleads guilty to felony count of tax evasion". New York Daily News. December 23, 2014. ^ "Grimm Stipulation of Facts". Retrieved January 2, 2015. ^ "Rep. Michael Grimm apologizes for tax evasion, but vows to stay in office". December 24, 2014. Retrieved January 2, 2015. ^ "Michael Grimm to resign from Congress: sources". NY Daily News. Retrieved December 30, 2014. ^ "Michael Grimm To Resign From Congress". The Huffington Post. Retrieved December 30, 2014. ^ Rachel Shapiro (December 30, 2014). "What happens after Rep. Michael Grimm resigns -- from special election to sentencing". Staten Island Advance. Retrieved January 4, 2015. ^ Ross Barkan (February 2, 2015). "Andrew Cuomo Still Won't Set a Date for Election to Replace Michael Grimm". The New York Observer. Retrieved February 4, 2015. ^ Rachel Shapiro (February 5, 2015). "Lawsuit looks to force Gov. Andrew Cuomo to set special election for Congress". SILive.com. Retrieved February 9, 2015. ^ John M. Annese (February 17, 2015). "Federal judge orders Gov. Andrew Cuomo to set a date for special congressional election". SILive.com. Retrieved February 18, 2015. ^ John M. Annese (February 17, 2015). "Cuomo's office says special election announcement will happen 'shortly,' but doesn't specify timeline". SILive.com. Retrieved February 18, 2015. ^ Emily Cahn (February 20, 2015). "Cuomo Schedules New York Special Election (Updated)". Roll Call. Retrieved April 18, 2015. ^ "The Wildest Story In The Republican Party Right Now". Business Insider. December 23, 2014. Retrieved December 30, 2014. ^ "District Attorney Daniel Donovan emerges as GOP front-runner for seat in Congress". SILive. December 30, 2014. Retrieved January 7, 2015. ^ "Staten Island DA Daniel Donovan announces bid for Congress". SILive. December 30, 2014. Retrieved January 10, 2015. ^ "District Attorney Daniel Donovan selected as GOP candidate for Staten Island congressional seat". SILive. January 10, 2015. Retrieved January 10, 2015. ^ "Former Congressman Vito Fossella doesn't want his old seat back". SILive. December 30, 2014. Retrieved December 30, 2014. ^ "Malliotakis to Catsimatidis: 'I'm inclined' to run for Michael Grimm's Congressional seat". SILive. January 5, 2015. Retrieved January 7, 2015. ^ "Malliotakis backs Donovan for Congress". Capital New York. January 12, 2015. Retrieved January 13, 2015. ^ Rachel Shapiro (February 27, 2015). "Staten Island Democrats select Vincent Gentile as candidate for Congress". Staten Island Advance. Retrieved March 2, 2015. ^ Rachel Shapiro (February 16, 2015). "Another Brooklyn Democrat emerges as a possible candidate for empty seat in Congress". Staten Island Advance. Retrieved February 18, 2015. ^ "Staten Island Democrats will interview potential candidates for Congress Feb. 11". SILive. February 2, 2015. Retrieved February 9, 2015. ^ Rachel Shapiro (February 11, 2015). "Staten Island Democrats interview three people but still have no candidate for Congress". Staten Island Advance. Retrieved February 18, 2015. ^ Paula Katinas (December 29, 2014). "Grimm resignation fires up speculation on replacement". Brooklyn Daily Eagle. Retrieved January 8, 2015. ^ Rachel Shapiro (February 13, 2015). "'Mr. Democrat' John Sollazzo wants to run for Congress on Staten Island". Staten Island Advance. Retrieved February 18, 2015. ^ Rachel Shapiro (February 23, 2015). "Brooklyn Assemblyman William Colton bows out of race for Congress". Staten Island Advance. Retrieved February 23, 2015. ^ "Assemblyman Michael Cusick 'still looking' at run for Congress". SILive. December 30, 2014. Retrieved January 7, 2015. ^ "Assemblyman Michael Cusick announces he is not running for Congress". SILive. January 25, 2015. Retrieved January 26, 2015. ^ Rachel Shapiro (February 23, 2015). "Robert Holst bows out of Congress race; leaves Vincent Gentile as lone Democrat". Staten Island Advance. Retrieved February 23, 2015. ^ Colby Hamilton (February 13, 2015). "Sources: Seddio backs Colton for special election". Capital New York. Retrieved February 18, 2015. ^ Rachel Shapiro (January 20, 2015). "DA Daniel Donovan gets nod from Brooklyn Conservatives in congressional race". Staten Island Advance. Retrieved January 21, 2015. ^ a b Rachel Shapiro (January 13, 2015). "Nicole Malliotakis: Daniel Donovan 'would be a good voice for us in Washington'". Staten Island Advance. Retrieved January 21, 2015. ^ "Calling it 'very tempting,' former Borough President James Molinaro considers run for Congress". SILive. December 31, 2014. Retrieved December 31, 2014. ^ "'I'm not interested': Former Borough President James Molinaro decides not to run for Congress". SILive. January 2, 2015. Retrieved January 5, 2015. ^ Rachel Shapiro (March 3, 2015). "Brooklynite James Lane emerges as Green Party candidate for Congress in 11th district". Staten Island Advance. Retrieved March 3, 2015. ^ Rachel Shapiro (March 2, 2015). "Independence Party backs Daniel Donovan for Congress". Staten Island Advance. Retrieved March 2, 2015. ^ Anna Sanders (January 7, 2015). "Dark horses and off-Islanders: Meet more people who want Michael Grimm's old seat in Congress". Staten Island Advance. Retrieved January 8, 2015. ^ Lovett, Ken (March 9, 2015). Dan Donovan ignores Reform Party at Conservative Party chair's request. New York Daily News. Retrieved March 9, 2015. ^ Nick Reisman (March 3, 2015). "Gentile Receives WFP Nod". State of Politics. Retrieved March 3, 2015.